Christmas Eve and it’s an unseasonably warm 65° in Central Park. A bride, escorted by her son, calmly starts her procession at the South East corner of Bow Bridge. Surrounded by family smiling ear-to-ear, she meets her groom at the apex. From her blush, backless gown to the rose shaped ring box, the bride poured attention into every detail. Today, head to toe, she shines. The wedding ceremony is always important to the couple but for Margie, I could tell this ceremony was very, very important to her. Both her and her groom, Jesus wanted a ceremony that reflected their shared Catholic background. Coming from the same religious upbringing, I felt fortunate to incorporate my first faith into a spirit-filled service for this couple. Margie specifically asked if I would wear minister’s robes. I was more than happy to oblige. I even sewed a special stole of gold brocade with red roses for the occasion. You can imagine our delight when Margie and I saw how nicely the stole complimented her wedding color scheme. I love little serendipitous moments like that. Margie’s sister read to us in Spanish. The couple wrote their own vows and followed them up with traditional vows. Jesus gave his personal vows in Spanish and Margie started hers by thanking everyone. In keeping with the Catholic tradition, Jesus and Margie’s service started with an invocation and ended with a benediction. In the middle, I broke away from tradition by inviting everyone to share in blessing the couple. Giving all the love I had to give that afternoon, was easy. Before the service started, I could feel the love and support from their family. A couple, passing by, stopped to watch the service. Hand-in-hand, their attention pointed, I could see they too could feel the love. 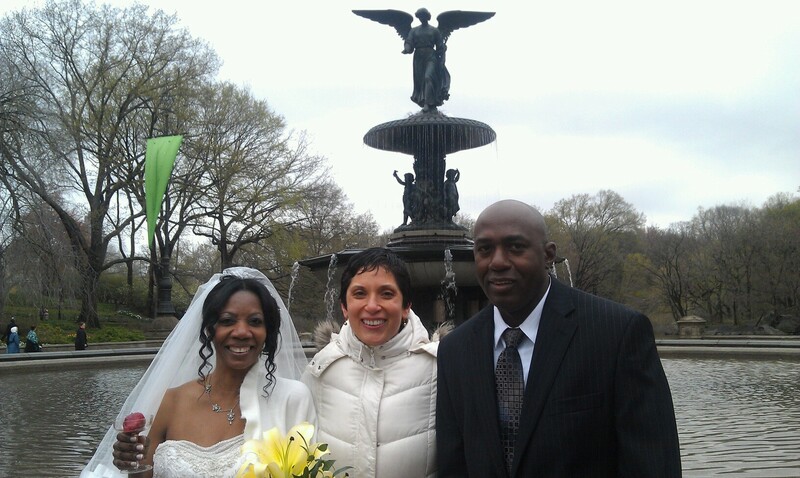 Married today in Central Park at Bethesda Fountain. You were real troopers in spite of the cold. Todd and I first met Carolyn and Roger when they came to our home to see about officiating their wedding. I was impressed with how wise this couple seemed and how open and friendly they were. Later I found out that they were looking for more than an officiant, but someone with whom they could make a real connection with. They talked about how dear their friends were and how they love to entertain guests in their home. Friends are truly important to Carolyn and Roger and they wanted their ceremony to reflect that. They chose to be married on a bright, sunny day in Central Park; one of those days that can only describe as just gorgeous. The park for them represented so much of their relationship. Quite regularly they would take walks through the park. It is where there they connect with each other and to nature; kind of a spiritual encounter. The previous Easter Sunday, Roger had proposed to Carolyn at Shakespeare Garden. They intentionally chose not to get married inside a church because as Roger put it, it was the “most boringest thing ever” he said with such matter-of-factness that we all had a good laugh. Instead they like to find the spirit of things anywhere they go. They commented that when they are together, they are like childhood playmates. They wake up every day already laughing, they told me. Not just the location but their wedding date had personal significance. Carolyn loves celebrating May Day with all the flowers, ribbons and lights. To commemorate May 1st, after the ceremony guests waived ribbon wands in colors lemon yellow and Caribbean blue. Their wedding day was marked by the New Moon of Ashwini Nakshatra, an auspicious day for marriage in the Hindu Vedic tradition. Among the many touching moments of this couple’s wedding day was the moment after Carolyn arrived at Cherry Hill with her mother via Pedi Cab. Roger went out to greet the two. As Carolyn’s mother made her procession to the ceremony, Roger and Carolyn took a moment to simply be with each other and enjoy the moment. Together, they then walked hand-in-hand down the center of the assembly as Roger’s mother played her violin. She was so happy to be performing at her son’s wedding. Once the ceremony began, tears started to roll. Many of the couple’s friends and family were so unspeakably happy for them. The bridesmaids wore Robin’s egg blue and gold summer dresses with gold pumps and pale blue pashminas. One of the bridesmaids was a long time friend of Carolyn’s who she hadn’t seen in ten years. Vibrant neckties in Caribbean paired with bright yellow flower boutonnieres wrapped in matching blue silk ribbon made a striking image wherever the groomsmen gathered. The bride looked stunning in a retro style dress she had specially made for the occasion. Peeking out from underneath her wide swing skirt were layers of soft peach-pink tulle. If you looked closely, you could see scatters of tiny fabric flowers gently cast along her portrait neckline that so flattered Carolyn’s shoulders. I love great design and this dress was a work of art. To honor Roger’s Filipino heritage and Carolyn’s Celtic roots, they chose to represent their backgrounds with a fasting ritual that melded the Filipino cord ceremony with the Celtic hand fasting ceremony. Both traditions draw upon the symbolism of binding two unique individuals to each other. In the Filipino tradition, the cords are draped over the couple’s shoulders. In the Philippines, it is a great honor to be chosen to place the cords over the couple. In the Celtic tradition, hands are fasted together by a cloth that holds significant meaning; many times it’s the groom’s tartan. While the cord lay over Roger and Carolyn’s shoulders, the couple recited traditional Celtic vows. In both traditions and as was the case that day, the cord was wrapped in a figure eight symbolizing eternity and loosely draped to symbolize that neither is restricted by the other and that the binding is only enforced by both their wills. After signing their marriage license, something they choose to make part of their ceremony, their ceremony ending with a nuptial kiss. There was no formal recessional instead guests mingled, pictures were taken and everyone eventually jumped into a yellow cab and headed to the reception including Todd and myself. It was a beautiful ceremony on a beautiful day filled with creativity, love, family and good friends.